Is it just me or are men more difficult to shop for? Women tend to drop hints or casually mention items they like, but men more or less buy whatever it is they’re eyeing, no? (At least my husband does.) Not to mention that the man has everything he could want or need, so shopping for him is tricky. This year, skip the gift cards. I’ve compiled a list of gift ideas for men that are as unique as the men in your life, and are sure to be a hit! For the man who loves golf. This golf hat looks so good on my husband. Brian immediately picked it from the box and put it on. Then he strutted around in it for three days straight. Its dark color helps it go with almost everything, and the “Live Lucky” stitching lends a bit of playfulness to it. Black Clover uses exclusive Memory-Fit technology to prevent headaches from longterm wear. It also prevents forehead marks and keeps your guy cool and dry with its sweat absorption. I guess that’s why he likes it so much :) I just ordered a spare one for him to keep in the car for impromptu tee times. Use discount code CLOVER10 for 10% off. For the man who loves TV on his terms. We recently ditched cable TV and are now streaming TV via Roku devices throughout the house, so this Roku Streaming Stick+ couldn’t have come at a better time. With Brian traveling for work during the week, the Roku allows him to stream the news and his favorite shows in 4K, HDR and HD wherever he goes. Roku has an advanced wireless receiver that gives you 4X the range! Its stronger signal means that he can watch his shows anywhere. We also love the wide range of apps available. You can watch over 500,000 movies and TV shows between free and paid apps. Roku makes it easy to watch anything we want no matter the streaming service. The remote makes it easy to navigate but the BEST feature is the Roku app for iPhone. It’s the ultimate portable remote, which means that as long as you have your iPhone you can control what show or movie you’re streaming. Perfect for streaming TV in the dark! Find the Roku Streaming Stick+ here. For the man who likes to be cool and comfortable. Arctic Cool launched in 2006 and is known for incorporating cooling technology into its clothing. This technology is called HydroFreeze X. It is a fiber-based, cooling management system, that move moisture away from your skin and lowers the temperature of the fabric so you can continue your workout and keep cool. Arctic Cool promises its shirts will keep you up to 30 degrees cooler! In the hot climate of Florida (and the humid summers of the East Coast) I’m not sure that I would appreciate a shirt more than an Arctic Cool one! 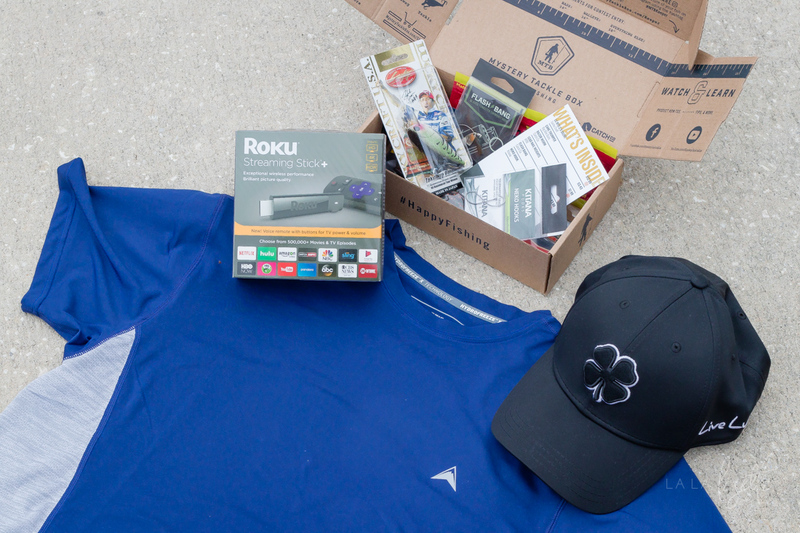 Just like with the Black Clover golf hat, Brian loved his Arctic Cool Instant Cooling Shirt. He loves to cook a feast in the kitchen, and he really appreciated the technology the other night when he was grilling dinner. That’s the first time I haven’t seen him sweat while grilling! We loved his shirt so much that we’re giving one away. See details below. For the man who loves to fish. This monthly subscription box is so cute, and I don’t even fish! One of my neighbors has this subscription box and I was always intrigued by all the lures he received. I liked that the Mystery Tackle Box included a booklet with tips and tricks on catching the fish the lures were designed to catch. There are several affordable subscription options (3 months, 6 months, or 12 months) and the recipient can customize their boxes based on their fishing preferences. Use discount code GIVEMTB for 5% off now through Dec 31st 2017. I hope this post gave you unique gift ideas for the men in your life that are hard to shop for. Be sure to enter the giveaway above for your own Arctic Cool shirt, and also check out the gift guide for health and fitness lovers. These are some really cool gift ideas. Men are so tough to buy for! I would wear the shirt for fishing! This would be great for my early morning run! My hubby would play basketball in it. I’d love this for playing tennis! This would be for my husband and I’m sure he would wear it all the time. Thank you! This would be great for running!